Brick and masonry features such as chimneys, walkways, water fountains, and other features can add beauty and practicality to any home. However, these products are just as susceptible to foundation repair as the concrete that makes up your home’s foundation, so they should be included in your home inspections. Keeping a close eye on your brick and masonry features can ensure the safety and beauty of your home. Leaning chimney: A leaning chimney can be cracked and leaning either toward your house or away from it. Visible gaps can often be seen between your home’s siding and the chimney itself. A leaning chimney is an emergency and should be stabilized and supported immediately. 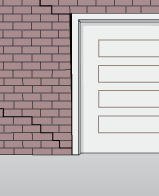 Garage column cracks: Garage column cracks can be dangerous because garage columns are usually supporting beams that hold the rest of the garage up. With garage column cracks, there is often a problem not only with your home’s foundation buy your garage’s foundation as well, which may result in floor cracks or wall cracks. Cracks in sidewalks or paths: When bricks are laid for sidewalks or garden walkways, it creates a beautiful visual effect. However, these pathways can crack just as easily as a foundation can, creating a tripping hazard for your family and your visitors. Rapid Foundation Repair will survey your home and consider the best options for your home. Underpinning may be necessary, which involves installing steel push piers or helical piers to lift and maintain the stability of your foundation. Underpinning can be useful for leaning chimneys and used under garages for garage column cracks. Wall anchors may also be necessary to support basement and foundation walls. Depending on the problems you’ve experienced with your masonry, there are many different possible repair options. Contact Rapid Foundation Repair today for more information on our foundation repair services. We are happy to help!